We examine in depth your Aware Inner Aspect and Field, as well as your energetic System of Awakening. Welcome to Workshop Six of the ONA Workshop Series. In this workshop, we will study Awakening, the Sixth principle of ONA and the principle that underlies your Sixth Field and Inner Aspect (Aware), and System. All about your sixth System, Field and Inner Aspect. Awakening is the process of becoming more coherent and cognizant of your surroundings and having the knowledge of your own placement there. Self (accessing all the aspects of yourself) to unconscious levels of encasement, i.e., armoring, accumulation of energy, etc. 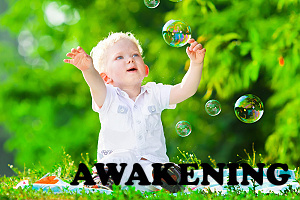 When we speak of awakening within ONA we are referring to being a conscious creator; being at the very core or center of that which you are awakening to. How to meditate using the Heart Breath. The heart area is a power house of source and a wonderful place to commune with. This breath will assist you to maintain a substantial relationship with your inner world. All about the color of Awakening (green). People who are drawn to this color tend to be benevolent, Humanistic, service-oriented and scientific. Many people here have a strong interest in the healing arts. Some learn to serve and help others as well as themselves with insights that they have learned to draw upon. They want to know and understand the plights of others as well as themselves. The &apos;sound&apos; of Awakening and how to use it. The energy that fulfills the creative focus and gives weight to the creative process through the fulfillment of the intended result. Through the creative process all things fulfill their intended purpose and order. How to clear and tune the energy vortices of the body. Although this process is always beneficial, it is specifically recommended when adjacent Systems, Fields, or Inner Aspects are interacting in suboptimal ways. For example, if a client cannot seem to distinguish between what he FEELS (beliefs) and what he THINKS (first-hand knowledge), the problem is that Systems Three and Four are not communicating properly. A vortex clearing, especially the Vortexes for Systems Three and Four, would be in order. How to perform the Heart meditation. There are many meditations and practices out there designed to activate and open the Heart Center/Chakra. This one is simple, and a terrific introduction to deep meditation in addition to its benefits on the Sixth System, Field and Inner Aspect.